Former Gurnee Fire Chief Fred Friedl’s long tenure as the area’s top firefighter was celebrated at a ceremony Wednesday night. Warren Waukegan Fire Protection District board members present retiring Chief Fred Friedl With a plaque commemorating his service to the District on July 19, 2017 at Gurnee Fire Station #2. 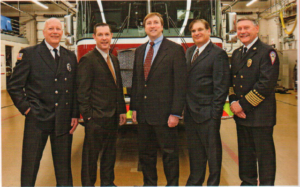 Fred Friedl became a part of the Gurnee Fire Department in 1996 and for twenty-one years served the Village of Gurnee and the Warren Waukegan Fire Protection District in accordance with its vision and principles. He has continually strived to provide quality fire and emergency services and to improve the well-being and safety of the citizens of the Village and the District. He has effected change within the Department culture to create a servant leadership so all members no matter of rank or tenure could grow and serve without limits. Each member of the Department remained accountable and was first a servant, contributing to the Department mission and serving to enrich the community that it served. Education and prevention were priorities as much as mitigation of fires and other emergencies. In March of 2004 Fred successfully completed the rigorous process for professional designation of Chief Fire Officer. The Commission of Professional Credentialing recognizes individuals who demonstrate their excellence in seven measured components including experience, education, professional development, professional contributions, association membership, community Involvement, and technical competencies. Chief Friedl began his career in the fire service in 1972 and has been a member of numerous fire service associations including the following: Area Two Representative for the Illinois Fire Chiefs Association, twice President of the Metropolitan Fire Chiefs of Illinois, Chairman of the Lake/McHenry MABAS Specialized Response Team, Lifetime Member of the National Fire Protection Association, and President of the Lake County Fire Chiefs Association. Chief Friedl has volunteered an extraordinary number of hours serving the local and surrounding communities. He was honored by the Exchange Club of Gurnee, the Illinois Lincolnland District Exchange Club and the National Exchange Club, where he received the Volunteer of the Year Award at the National Convention in Portland Oregon. 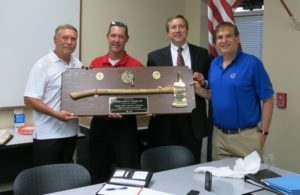 He was also honored as Exchangite of the Year during Gurnee Community Days. Perhaps none of these accolades was as meaningful as a Merit award he received for service in the line of duty for saving the life of a young boy trapped by fire in his second-floor bedroom, an early harbinger in a life of protecting the safety of others. In 2009 Chief Friedl was inducted into his High School Alumni Wall of Fame. The Wall of Fame was established to honor the achievements and contributions of outstanding alumni. The Annual Fire Safety Expo returns to the Gurnee Mills parking lot on Saturday, May 13th from 10:00 am to 3:00 pm. Learn all about fire safety education at this free event located in Parking Lot E (near Bass Pro Shops). Enjoy family-friendly activities, food and more, sponsored by the Lake County Fire Chiefs. Visit www.gurneemills.com for more information. 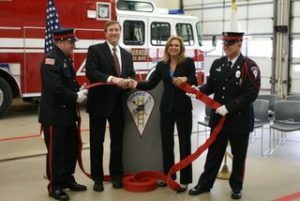 Warren-Waukegan FPD President Phillip DeRuntz and Gurnee Mayor Kristina Kovarik officiate at the February 27th Ribbon-cutting Ceremony for the Gurnee Fire Department’s new 2017 Ladder Fire Engine. This was another example of a very collaborative relationship between Lake County government agencies in support of their wonderful communities. The supply of Narcan kits police carry to help revive people who have overdosed on an opioid was dangerously low, according to the Lake County Health Department, but then a foundation and a fire protection district came to the rescue. Plus, the new kits that are being bought are described by advocates as an easier-delivery nasal spray type that was fast-tracked by the U.S. Food and Drug Administration.  “We could have been in dire straits if it wasn’t for the Filler Foundation of Highland Park and the Warren-Waukegan Fire Protection District,” said Susan McKnight, coordinator for the county’s substance-abuse program. Phillip DeRuntz, a trustee with the fire district, said that at the last monthly meeting of the Lake County Opioid Initiative, he learned the health department was down to its last 50 kits. Then Susan Guggenheim of the Filler Foundation spoke and said officials were starting a matching grant program for kits up to $25,000. “I took the information back to my board and they were ecstatic to help,” he said, joking about how the fire department was helping out the police department, a relationship that isn’t always smooth. “I told the next meeting that the fire protection district wanted to support law enforcement, and there were all these police chiefs there, and they laughed and applauded,” he said. McKnight said the new kits, which have two doses per kit, is from a company called Adapt Pharmaceutical and do not have to be assembled like some pharmaceutical devices. It can also be used in just one nostril where others need half a dose in one nostril and half in another. For the last two years, the health department has secured 3,000 kits a year for distribution among the 2,000 law-enforcement officers in the county from the Virginia-based Kaleo company. Because of a shortage this year, the department was only able to provide 1,000 kits, which were the injectable type. Guggenheim said the Filler Foundation was created by Mark and Julie Filler of Highland Park, who lost their 23-year-old son after he got hooked on opioids after a sports injury. He was revived once at home by paramedics during his fight with the addiction and was sent to rehabilitation, but then a few weeks after he got home, he died of an overdose. 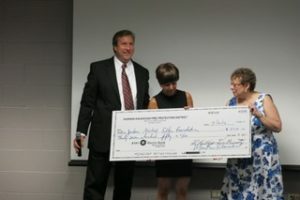 “This was an area we could make an immediate impact and save a life,” she said of the foundation’s gift of $40,000 and the matching grant challenge of up to $25,000. They matched the fire district’s $3,750 and have received more donations for the program, including a recent $1,000 contribution from Compass Health of Northbrook and $1,800 from the Vernon Hills Police Department. She said they also now have a text-line donation source where individuals can contribute any amount by texting “Hero23” to 41444. The fire department is hosting a Blood Drive Saturday February 11th, from 8 am-2 pm at Fire Station 2 (6581 Dada Drive, Gurnee, IL. 60031). The blood donation itself takes about ten minutes of your time. Reservations are recommended at www.lifesource.org or 877-543-3768. Use Sponsor Code G110 when making your appointment. Walk in donations are always welcomed. Donors that are interested in donating blood, but can’t meet the scheduled date, may give blood on any date/time at any Lifesource location.  Please use Gurnee Fire Department Sponsor Code G110 when making your appointment; this will include you in our collection goal. Our hope is to have a total of 50 donors or better in this blood drive. When donating, it is IMPORTANT to bring a valid photo ID showing SSN# and/or DL# with you. 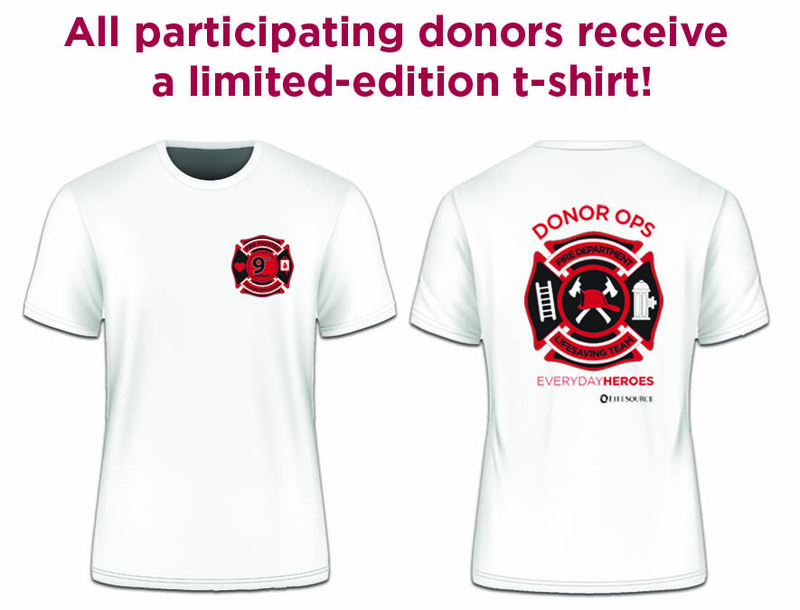 If you have any questions regarding the blood drive itself, feel free to contact David Douglass at DDouglass@fire.gurnee.il.us or 262-945-3386 (cell). Donate Blood, then Make An Appointment and use Group Code G110. The Exchange Club of Gurnee is holding a “9-11 Remembrance Ceremony” on Sunday, September 6th. The event will take place from 1-2:30 pm at the Viking Park Bandshell (4374 Old Grand Avenue, Gurnee). The Warren Township High School Football team is hosting a blood drive on Sunday, August 23rd from 8:30 am – 2:30 pm.